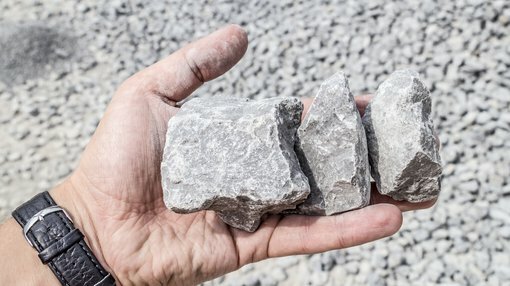 Delecta Ltd (ASX:DLC) has informed the market that recently acquired sampling results from the Highline Cobalt-Copper Project in Nevada have confirmed the high grade nature of the mineralisation. The sampling produced cobalt results of up to 7.08% and copper results up to 12.4%. A total of 19 samples were taken, 17 from the Highline Claim Group and 2 samples from mullock at Pocahontas. These samples consisted of chip channel samples from accessible underground workings and dump samples from both the main workings and other prospecting pits. Delecta managing director Malcolm Day said, “I am very pleased with the results released to us by the vendor. “It reaffirms our commitment to the project and demonstrates the high grade nature of the mineralisation. “Given the Highline mine’s previous mining and exploration was circa 100 years ago, the company believes that the cobalt-copper project represents a relatively low risk opportunity in an area of known mineralisation”. Of course it is early stages in the development of the project, so investors should seek professional financial advice if considering this stock for their portfolio. Delecta has entered into a binding option agreement to acquire a 100% interest in the high grade Highline Cobalt-Copper Project. The Highline acquisition is part of Delecta’s diversification strategy aimed at capitalising on the demand for battery minerals such as cobalt, lithium and vanadium which has seen the rapid rise in the London Metals Exchange (LME) price of cobalt from US$23,000 per tonne in March 2016 to US$58,000 per tonne in October 2018. Management intends to utilise the 90 day option period to complete a geological review of the project and surrounding area and conduct an initial exploration program to identify and map mineralisation both at surface and within existing accessible workings. The following results highlight some of the high-grade mineralisation delineated. At the Highline Mine the drive followed a vertical fault zone to a mineralized zone that was stoped and assumed to be the source of the reported production. The initial two samples HHL001 and 2 are from the fault zone. Samples HHL003 to 6 inclusive show the presence of increasing amounts of mineralization with sample HHL006, taken on the edge of the stope, returning 0.289% cobalt and 0.493% copper. Samples HHL010, 11 and 15 to 19 are from mullock surrounding the adit. They returned varying amounts of cobalt and copper ranging from 0.325 to 1.72% cobalt and 0.169 to 12.4% copper. Other shallow adits and prospecting pits are present above the main adit testing bedding plane hosted mineralisation. 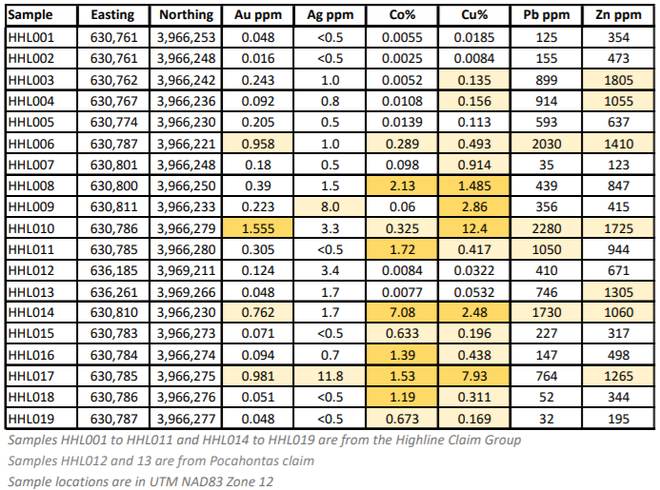 Some may be testing the up dip extension of the mineralisation that was exploited from the stope while others are possibly related to a parallel mineralized zone. Samples HHL007, 8, 9 and 14 were taken from these workings, and they returned from 0.06% to 7.08% cobalt and from 0.914% to 2.86% copper. 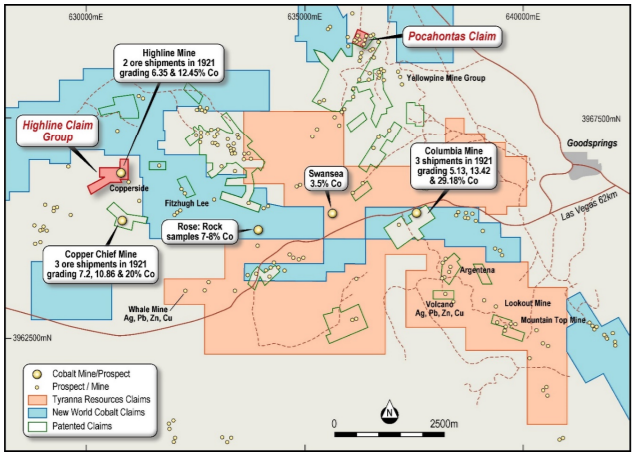 There were also signs of lead and zinc mineralisation at an adit on the Pocahontas claim which lies on the blower contactable limestone unit, and this will be the target of further exploration should the acquisition be completed.